Don't miss this weeks FREE concert of Green Valley @ Magdalena 2017! Rototom Sunsplash is preparing a special reggae party in Spain! 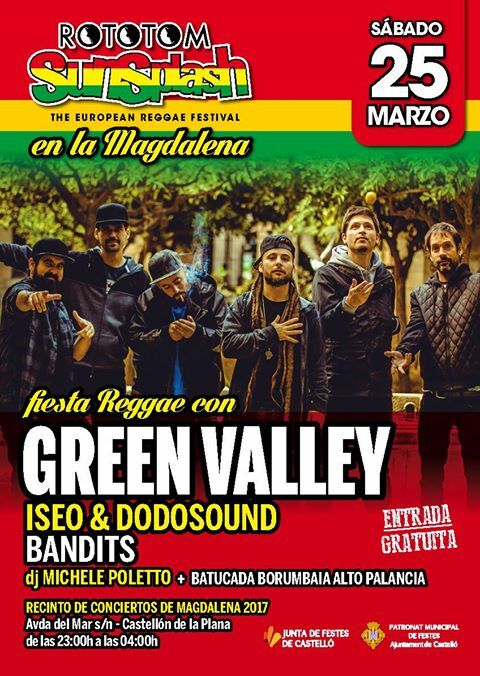 Fiesta Reggae con GREEN VALLEY, Iseo & Dodosound, Bandits, Dj Michele Poletto + Batucada Botumbaia Alto Palancia. Green Valley said that they are going to record a very special video at the concert, so make sure to come if you have a chance!
! FREE ENTRY ! ENTRADA GRATUITA !